I grew up reading a bunch of comics. I initially started with the Marvel / DC types, then moved on to the British comics such as 2000AD and Tiger whilst in secondary school, and returned to Marvel / DC after that when i studied in the UK. I used to like this series as it combined classic noir sleuth stories in a future context – with investigations revolving around robot crimes. Strontium Dog wasn’t one of my top stories in those days, but i sort of liked the concept of mutant bounty hunters. Nemesis the warlock was one fantastic comic series that i liked because of the extreme artwork. The stories were unusual and surreal, but the art and concept was out of this world. Rogue Trooper was a popular story amongst my friends at the time. This was a classic war story that kids my age then loved. The twist was that this was a story about a Genetically engineered soldier who was looking for his commanders who betrayed them. 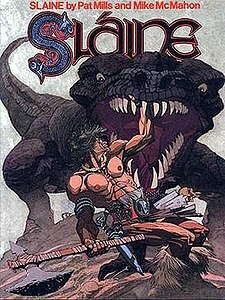 Slaine was a typical barbarian tale that was quite popular with kids our age then. one complaint that is often heard from newcomers to the award-winning series is that, after four years of intricate plotlines, it’s tough to jump in the middle of the story and follow along. Our first answer to that would be to spool up your FTL drives and jump in anyway, because you don’t want to miss this excellent series. But we’re also willing to acknowledge that Galactica has gotten pretty complex over the years, which is where our second answer comes in — in the form of this new feature, which we’ve dubbed Battlestar Galactica: The Timeline. occassionally, i would need a refresher of the happenings and chronology of battlestar galactica. the above link is a good start. Unless you’ve been living in a cave for the last four years, you know that the cheesy old sci-fi TV series known as Battlestar Galactica got picked up, dusted off, and given the all-time, grand champion, mother of all reboots. Solidly led by a couple of veteran movie actors (Edward James Olmos and Mary McDonnell), BSG has garnered a reputation as one of the best shows on TV. But don’t just call it a sci-fi show; its so much more than that. It’s about love and loss. It’s about what it means to be a soldier, and what it’s like to be a refugee. It’s about religion and fanaticism. It’s about government and corruption. But mostly it’s about our own humanity, and what it really means to be human. Since some of us here are at RT are huge BSG fans (and we’re betting some of you are too), in honor of the beginning of the end (starting next week), we thought we’d share a list of “thinking man’s” sci-fi films; sci-fi stories that aren’t about laser battles or rampaging mutants, but more thoughtful pieces on what it really means to be human. i would like to have a list of sci-fi TV series – where i would put BSG, Firefly and X-Files amongst the best. When the present promises only economic hardship and political upheaval, what does the future look like? In 2009, it looks like a world of gleaming spaceships filled with enlightened people who have emerged with their humanity intact after a terrible war. They have entered the 23rd century, shed racism, no longer use money, possess seemingly magical technologies and are devoted to peaceful exploration. I refer of course to “Star Trek” and its powerful story of a better tomorrow, which has been mesmerizing audiences for almost half a century and returns to movie theaters this coming May with an eagerly anticipated 11th full-length feature. But wait. The future also looks like this: a dark, violent world where a horrific war between humans and cyborgs leads to the near-extermination of humanity. This vision, in the latest “Terminator” movie, is also arriving at your nearest mutiplex in May. We imagine the future in places other than the movie theater, of course. Still, these two familiar franchises underscore the conflicting stories we tell ourselves in uncertain times about what lies ahead: Either we’re bound for a techno-utopia of adventure, or a grim, Orwellian dystopia where humanity is on the brink of implosion. science fiction stories can often be looked at as warnings of our future, or sell us hope for humanity. our present day is a complex cacophony of events, disease, strife, poverty, conflicts, discoveries, changes in human behaviours, alliances etc. for those of us with children, we wonder what sort of a world are we raising our children in, and what world is in store for their children. it is often scary. but hopeful. many of the predictions in science fiction may or may not come true, but one thing that fascinates me is what is the prediction of human behaviours… as this will determine whether our future is bleak, or pleasant. once again, this is the very question asked by the Joker and Batman in Dark Knight. Are we all madness waiting to come out, or do we have good in ourselves?